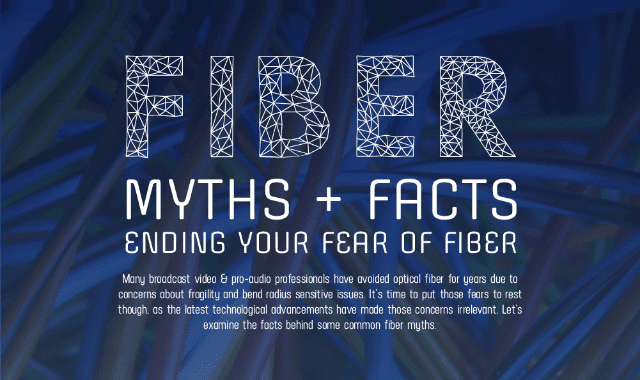 Ending Your Fear of Fiber #Infographic ~ Visualistan '+g+"
Many broadcast, pro-video, and pro-audio professionals have avoided optical fiber and relied on copper cables for years, and it was due to their fears that fiber optics are too fragile, aren't fast enough, are difficult to install, suffer signal loss, and don't offer any bandwidth advantages compared to copper. Some of these perceptions might have been true in the past, but with the latest technological advancements, fiber is now incredibly durable, can be easily installed, offers transmission at extremely high speed, and can transmit longer distances while suffering less attenuation than copper. The previous concerns surrounding fiber are no longer applicable, and the durability and huge bandwidth of fiber gives it a clear advantage over copper. If you are still hesitant to choose fiber optics over copper, then it's time to rid of your fears. While copper was the cable of the past, fiber is the cable of the present and future.